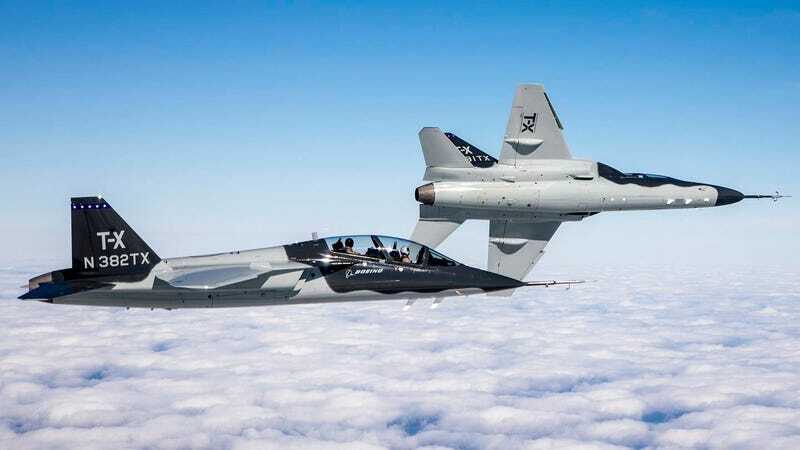 The US Air Force’s long-running competition to find a replacement for the aging Northrop T-38 Talon jet trainer has come to an end, and Boeing, with its teammate Saab, has been named the winner. Boeing’s twin-tailed, single-engined T-X was pitted against Lockheed and Korea Air Industries who offered the T-50, while Italian firm Leonardo and their American subsidiary offered the T-100 (Alenia Aermacchi M-346 Master). Both the Lockheed and Leonardo designs were already in production, while Boeing was the only manufacturer to offer a clean-sheet design. This is the third big win for Boeing, having recently received a contract to build the MQ-25A Stingray aerial refueling drone for the US Navy, as well as a replacement or the Air Force’s UH-1N helicopter that is used primarily to provide security at America’s nuclear missile silos. This contract has the potential to be a big money maker for Boeing. In addition to the 350 aircraft that the Air Force plans to order, there will almost certainly be international orders, and Boeing will likely also develop an armed variant. The Air Force contract also calls for as many as 50 simulators plus all the other parts and service that come along with any new jet. Saab has also stated that, should the Boeing entrant be selected, they intend to build a manufacturing plant in the US. Though the T-38 is getting very long in the tooth, having served for over 50 years, initial operations of so-far-unnamed T-X aren’t planned until 2024.